Jonathan Salazar will be a guest on The Jimmy Star Show live radio/tv show Wednesday Wednesday June 1st, 2016 from 3-5 pm ET | 12-2 pm PT at w4cy.com Radio | Visit www.jimmystarshow.com. NEW YORK - May 29, 2016 - PRLog -- Jonathan Salazar will be a featured guest on The Jimmy Star Show live radio/tv show hosted by King of Cool Jimmy Star along with Cool Man About Town Ron Russell to discuss his new series "A Hot Mess", his career and the entertainment industries at large. The Jimmy Star Show is tv/radio's coolest hit show, featuring the coolest in music, entertainment, fashion and pop culture, all from a fun industry insider perspective in a completely live, unedited fast-paced two-hour conversational format. Jonathan Salazar is an actor who first fell in love with theatre in Austin, Texas where he was born and raised. From the first time that he set foot on a stage in high school, he knew he'd fallen in love with the art. Since then He found himself in New York where he Co-founded 9 to 5 Productions; A theatre company that caters to artist who work 9 to 5 jobs, but have the aspirations of performing; and Founded Permanent Pictures and Hot Mess Films where he'll produce his new hit series "A Hot Mess." As a student of acting, Jonathan attended Sul Ross State University, and Texas State University where he pursued a Bachelor of Fine Arts degree in Acting, and Performance and production. He studied and practiced the techniques of Chechov, Meisner, and even Spolin. His recent work as an artist is producing, Assistant Directing, Choreographing, and Acting as Chip Tolentino, in 9 To 5's Inaugural production of "The 25th Annual Putnam County Spelling Bee." Not only is he currently working on stage, but He'll Be starring as Marcus, In the new series "A Hot Mess." Some of Jonathan's past credits include The Pirate King "The Pirates of Penzance," Tommy Boatwright "The Normal Heart," Seymour "Little Shop of Horrors," and was part of the Award winning casts of "The Rocky Horror Picture show" in San Antonio, TX and "Catch Me if You Can" in Austin, TX. Jonathan is now living in New York, where he attends Pace University and is Studying Business Administration, and Psychology. He's excited to be working alongside very talented individuals, and can't wait to show everyone how hard work, and dedication pays off! 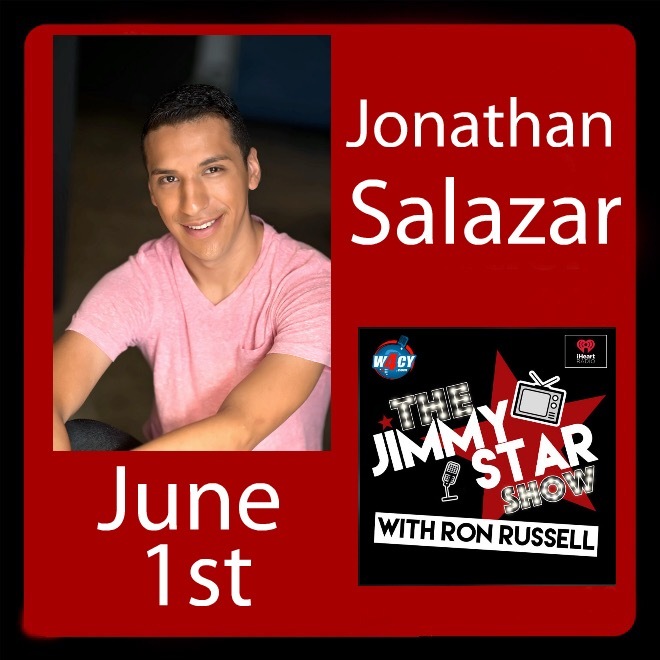 The Jimmy Star Show is pleased to showcase the expertise and talent of Jonathan Salazar and all anticipate a fun and informative time talking with him about his career and the entertainment industries at large. Join King of Cool Jimmy Star, and Cool Man about Town Ron Russell as they have a playful and sometimes wild time with the talented featured guest! To hear/watch Jonathan Salazar live on The Jimmy Star Show tune in to W4CY Radio on Wednesday June 1st, 2016 from 3-5 pm ET and 12-2 pm PT online at www.w4cy.com from anywhere in the world.